GROW IT. KNOW IT. | Kale Me! It’s not every day that a middle school student in the public school system eats radishes. Or kale. Or cherry tomatoes. Or kohlrabi! It’s a rarity, in itself, to see a child eat any of these things, really. 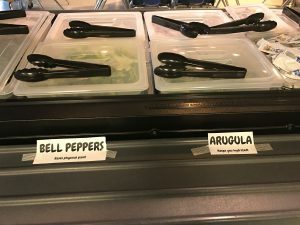 Thanks to donations made by UGArden, (the University of Georgia’s organic garden run by college students) and with the support of the Clarke County School District, Clarke Middle School students had the opportunity to eat local, organic produce at no extra charge during their lunch period. You would be surprised to know how many students tried the vegetables! It was a pleasant surprise for Julia Calder, AmeriCorps VISTA, and she was able to ask students a few questions about their interest and their thinking about local foods versus industrially grown produce. 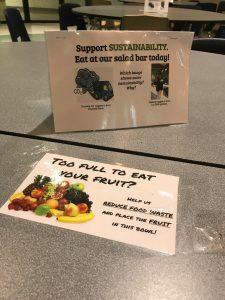 When asked, students were confident in answering the question “What looks more sustainable: a truck shipping produce across the United States or a Clarke Middle School student picking produce out of the ground?”. Their answers reflected their understanding of what sustainability can mean. Local means more fresh, local means less harmful to the environment. Produce that is transported across country can mean less tasty foods, more exotic foods but at a higher cost and lots of pollution. We hope to host one to two more of these Garden Bar days this fall. Thanks to student interest it is very possible! We hope to continue educating students on how easy it is to incorporate produce into their diet. Not only is it good for their overall health but also helps with concentration in class, can improve their athletic abilities and promotes better sleeping habits. THANK YOU CCSD, THE CMS KITCHEN STAFF AND THE UNIVERSITY OF GEORGIA FOR THEIR CONTINUED SUPPORT OF OUR PROGRAMMING. Looking forward to many more salad bars! 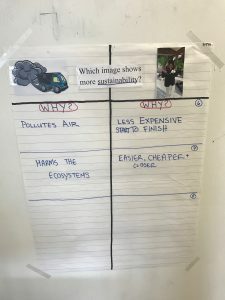 Posted in Farm to Table, Food Systems, School Gardens, Student Minds, Uncategorized, Urban Farming. Bookmark the permalink.